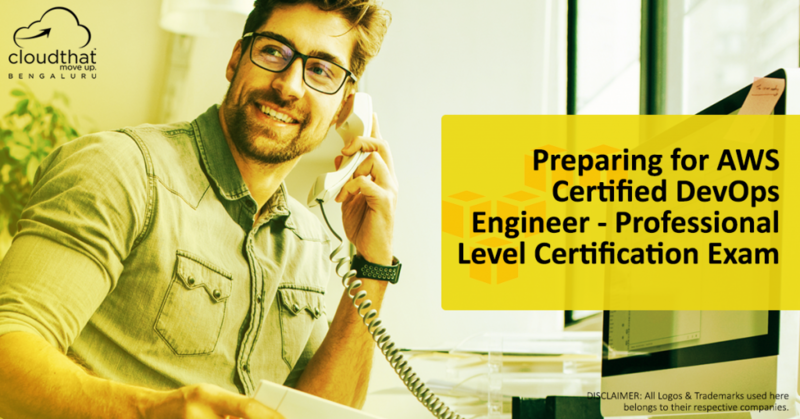 AWS Certified DevOps Engineer – Professional Level exam merges two certification tracks into one. Their Developer & SysOps Administrator exam at Associate Level converges into a single exam at Professional Level i.e. AWS Certified DevOps Engineer Certification Exam. In this blog, I’ll share my experience about the same. Before this DevOps exam, there was only Solutions Architect track which was available at the Professional Level (check our blog on how to prepare for Solutions Architect – Professional Level). Now with their DevOps Engineer exam, AWS has made the Professional Level complete. Infact, now there are three speciality exams as well, Big Data, Security, Advanced Networking Speciality. Below is the updated chart for their current certification tracks. AWS Certified DevOps Engineer – Professional Level exam that I appeared for seemed to be a comprehensive exam focusing more on the automation part. The exam had a good mix of questions for both infrastructure provisioning automation and application deployment automation. Almost all the questions were scenario based and targeted to check your hands-on knowledge of using different services from AWS that can help an organization implement DevOps. In the sections below I’ll cover some more in-depth details about the exam. But, before you can appear for the exam, there are some pre-requisites. The pre-requisite for appearing for this certification exam is that you should already have cleared Associate Level certification for either AWS SysOps Administrator or AWS Developer. Without this you cannot appear for Professional Level DevOps exam. However, I feel practical experience will be really useful here as the kind of questions that get asked are majorly scenario based. The cost for the DevOps certification exam is $300 on lines with Solutions Architect Professional Level certification exam. You might also be able to find some discount coupons for certification exams at AWS public events. The exam has about 80 multiple choice questions. There is no hands-on or writing needed as part of the exam. The duration of the exam is 170 minutes. I felt this was a very long exam as most of the questions were quite lengthy and in case you are not a fast reader, It’ll be difficult to attempt all the questions. Below are the exam domains and the extent to which they are represented in the exam. This is the area where you can score the most if you are well prepared, otherwise the same topic will let you down. The questions were mostly centered around CloudFormation and Elastic Beanstalk and asked a wide variety of implementation level challenges when you have to automate the provisioning of infrastructure using CloudFormation, configuring it using bootstrap actions or deploy an application using Elastic Beanstalk. You should read a lot about CloudFormation stack updates and how you can prevent certain resources inside your template from getting updated. Other area that was heavily dominated was rolling updates and rollback using Elastic Beanstalk with minimum or zero downtime. Also, how to use Route53 and Elastic Beanstalk together to perform A/B testing of environments/application versions. There were not many questions around CLI or SDK, but if you have worked with either one of them briefly, you should be able to answer them. As the name suggests, this section had very standard questions around CloudWatch involving setting up of alerts, trigger actions, custom CloudWatch metrics, etc. Also, CloudWatch Logs is one of the important services that’s part of the exam. This section featured questions about different ways to keep your environments in isolation e.g. if it’s a good idea to use different VPCs under the same account or different AWS accounts altogether. Also, if you are using the same account for different teams/environments, how to control the access to different resources. There were one or two questions about consolidated billing and tag based billing. Most of the questions around setting up security using VPC/Subnet/SecurityGroup/IAM Roles were in some way tied with the scenarios involving CloudFormation or Elastic Beanstalk or OpsWorks as well. It is also a good idea to read about CloudTrail and AWS Config. This section carried standard questions related to fault tolerance and high availability. There were not many questions related to it, but the ones which were part of the exam were related to standard 3-tier architecture involving Web, App and Database tier with traffic flowing through Route53 and ELB. Overall the exam seems comprehensive and hands-on experience with AWS is a must. I found most use-cases centered around CloudFormation, Elastic Beanstalk and some around OpsWorks too. The focus was mainly on minimizing the downtime and make your delivery pipeline faster by automating almost everything from provisioning to configuration to application deployment. Here is some additional information that can help while planning for this exam. CloudThat also offers a course to help you prepare for this certification. If you would like us to contact you with more info, please fill out this form and we will get back to you. If you have not already cleared Associate Level certification, do it now. Check out our courses for AWS Developer Certification and AWS SysOps Administrator Certification. We’ll get back to you with the details about next batch for AWS DevOps Training.